CATON, a township, a chapelry, and a subdistrict in Lancaster district, Lancashire. The township lies on the river Lune and the Midland railway, 4¼ miles NE of Lancaster; is in Lancaster parish; includes Littledale hamlet; and has a station on the railway, and a post office under Lancaster. Acres, 8,373. Real property, £6,683. Pop., 1,160. Houses, 223. The property is much subdivided. A rising ground commands a noble view, much praised by the poet Gray, of the valley of the Lune, backed by Ingleborough mountain. Coal and slate are found; and the cotton manufacture is carried on. The chapelry comprises all the township, except Littledale hamlet. The living is a vicarage in the diocese of Manchester. Value, £100. * Patron, the Vicar of Lancaster. The church was rebuilt in 1864. There are Independent and Wesleyan chapels, a national school, and charities £20. The subdistrict contains also Quernmoor township and Claughton parish. Pop., 1,817. Houses, 346. Details about the census records, and indexes for Caton. You can also perform a more selective search for churches in the Caton area or see them printed on a map. The Register Office covering the Caton area is Lancaster. Ask for a calculation of the distance from Caton to another place. "CATON, a township joined with Littledale, in the parish of Lancaster, hundred of Lonsdale South of--the Sands, in the county palatine of Lancaster, 5 miles to the E. of Lancaster, its post town. It is a station on the Skipton and Lancaster branch of the Midland railway. The township is situated in a picturesque district on the S. side of-the river Lune, and contains coal and slate. Some of the inhabitants are employed in the flax-mills and cotton factories. Caton is the seat of a Poor-law Union, The living is a perpetual curacy in the diocese of Manchester, value £100, in the gift of the Vicar of Lancaster. There are charitable endowments, partly for education, worth about £20 a year. A Roman way is supposed to have passed near this place, various Roman remains having been found in the neighbourhood." "LITTLEDALE, a township and chapelry in the parish of Lancaster, hundred of Lonsdale South of the Sands, county palatine of Lancaster, 5 miles N.E. of Lancaster, its post town. It is joined to the township of Caton, and lies near the river Lune, of which it commands a view, celebrated by the poet Gray. Coal and slate are found. Many of the inhabitants are engaged in the neighbouring cotton and flax mills. The living is a perpetual curacy in the diocese of Manchester, value £48, in the gift of the vicar of the parish. The church is a small stone edifice dedicated to St. Anne, built in the last century. The Dissenters have a place of worship here, and there is a parochial school." In 1835 Caton was a township in the parish of Lancaster. 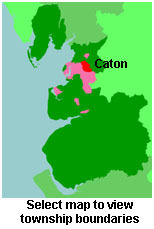 You can see the administrative areas in which Caton has been placed at times in the past. Select one to see a link to a map of that particular area. View maps of Caton and places within its boundaries. A tithe map of Caton in 1843. The Workhouse site has an interesting description of Caton workhouse. For probate purposes prior to 1858, Caton was in the Archdeaconry of Richmond, in the Diocese of Chester. The original Lancashire wills for the Archdeaconry of Richmond are held at the Lancashire Record Office.